Cathy Brown is a skilled journey woman in the Laborers’ Union. Despite highway, rail, and bridge construction projects all around her, she’s worked only five months this year and struggles to keep a roof over her head. We, along with Ms. Brown and several other worker centers, labor and civil rights advocates will meet with US Labor Department (DOL) leaders next week to discuss hiring regulations that impact all American workers. We are petitioning the The White House Administration to update federal contracting regulations to ensure good federal construction jobs fairly include Black communities. In 1965, at the height of the civil rights movement, President Lyndon B. Johnson signed into law Executive Order 11246, which established non-discriminatory practices in hiring and employment on behalf of the U.S Government. This pivotal regulation was the first to set standards for diversity on federal and federally-assisted construction projects. It is unconscionable that it has not been updated in 36 years, given the increased diversity of our nation’s population and the growing poverty in our communities. At this moment in our nation’s discourse about racial justice and the fundamental proposition that #BlackLivesMatter, the crisis of underrepresented Black workers must be addressed. Our meeting with the US Labor Department comes on the heels of the recently released Movement for Black Lives policy platform, which mandates federal and state job programs to provide living wages and encourages support for local workers’ centers, unions, and Black-owned businesses which are accountable to the community. The Movement for Black Lives platform rightly draws the connection between the physical violence of police shootings and the daily economic violence experienced in Black communities where quality jobs are almost non-existent. Both types of violence are rooted in institutionalized anti-Black racism that has quietly destroyed our families, our neighborhoods, and ultimately American cities with genocidal rates of unemployment and underemployment. In Los Angeles County, nearly 50% of Black working-age people suffer unemployment or underemployment. The so-called economic recovery is leaving many of our families behind. Across the country, our communities are organizing against the crisis — mobilizing for public demonstrations — from die-ins against police killings, to marches for higher minimum wages. 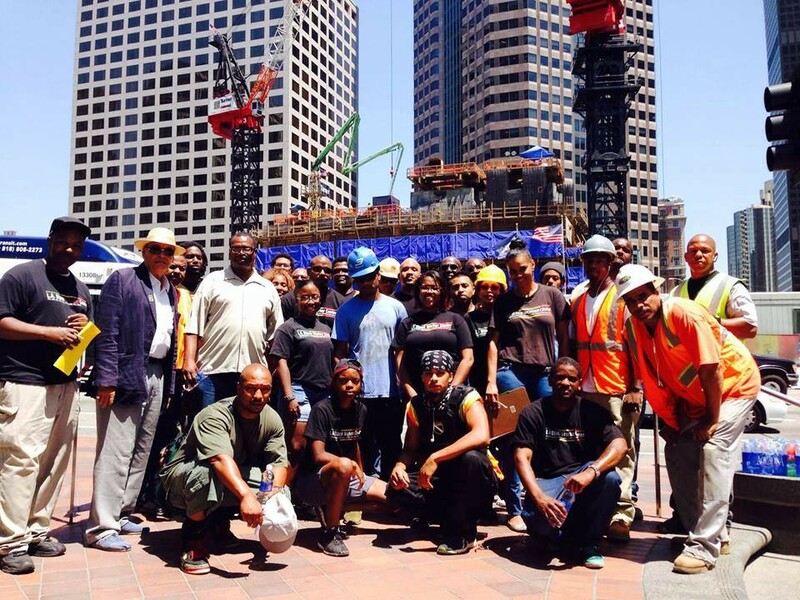 In Los Angeles, unemployed members of the LA Black Worker Center monitor federally-funded construction projects and advocate for change in public policy and corporate practices in the construction sector to ensure the billions of public dollars invested in federal construction projects become an opportunity for Black workers and their families. Further, Hillary Clinton’s campaign has declared a need for federal investment in infrastructure jobs, and a focus on construction apprenticeship as a solution to the crisis; but the reality is that many of the workers Clinton aims to help will not reach apprenticeship if federal contractors do not have proper hiring benchmarks. In New York City, Blacks make up 25% of residents but less than 13% of the construction workforce. In Los Angeles, where underrepresentation often leads to hostile and unsafe work environments, there is a development boom with large scale construction projects underway to modernize Los Angeles International Airport (LAX) and to expand the rail system. Black workers represent 10% of construction apprentices but only 3% of the construction workforce. Moreover, a construction study in Baltimore concluded Black workers who attended the same trade school and earned grades that were as good as, if not better than, their white counterparts still ended up being less likely to find gainful employment in the construction industry. A Los Angeles construction worker, while using the worksite port-a-potty, was confronted with “Go home n****r” written on the wall, and Black workers in Oakland and South Jersey were confronted by nooses at their workplaces. These realities signal an urgent need to shift industry culture. We encourage the Administration to use current census-based standards to set disaggregated goals for hiring. Without this change, women, Asians, and Black people will continue to be isolated, grossly underrepresented in the construction industry, and excluded from good living wage construction jobs. We are not alone in the call to action. Rep. Robert C. Scott,(VA-3) , who is the Ranking Member of the Education and the Workforce Committee, Rep. Karen Bass (CA- 37), and Rep. Judy Chu (CA-27), have also urged the US Labor Department to update and disaggregate construction hiring goals to better reflect demographics in places like Los Angeles where people of color are the majority. Part of President Barack Obama’s legacy should include revising the outdated guidelines of Executive Order 11246 to bring real diversity to an industry that has been resistant to it for so long. When there is fair access to federal construction jobs, all workers, including Black workers, will be elevated — and diversity on these projects will be maximized. — This piece was co-written by Tanya Wallace-Gobern, Executive Director, National Black Worker Center Project & Patrisse Marie Cullors-Brignac, co-founder of the Black Lives Matter Global Network and Senior Fellow at MomsRising.